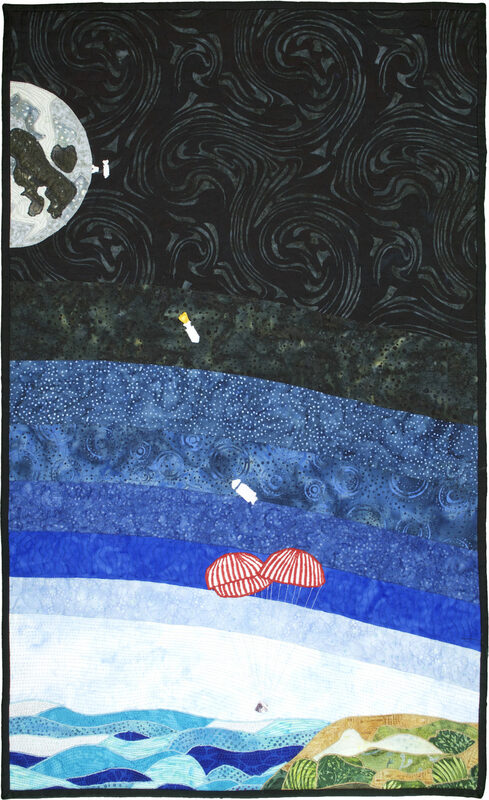 The Voyage from the Moon back to Earth was co-designed with my sister, Joanne Hillestad. It shows the journey back from the moon. The first lunar landing lasted for about 21-1/2 hours before it was time to lift off of the moon and begin their voyage home to Earth. At the end of their stay on the moon, the upper section of the lunar module was jettisoned and docked with the command module while the lower section of the lunar module remained on the surface of the moon. The two astronauts transferred from the lunar module to the command module and then the lunar module was ejected and eventually crashed on the surface of the moon. The flight back to Earth took about 2 days. To prepare for landing, the astronauts moved into the command module and the service module was ejected. The command module parachuted into the ocean 7 minutes later. The entire trip to the Moon and back lasted about 5 days. While designing this quilt I paid special attention to the details to try to get them as scientifically correct as possible. So while many artists use symbolism in their work, my work is all about the marvels of engineering. My art quilt was appliqued and satin stitched using a sewing machine. It was quilted on a long arm quilt machine and a sewing machine. My quilt was made out of cotton quilt fabrics.